Rather than taking the standard Christmas card photo in front of the tree at home, mix it up this year and plan a trip to a Virginia destination to take your holiday pictures. 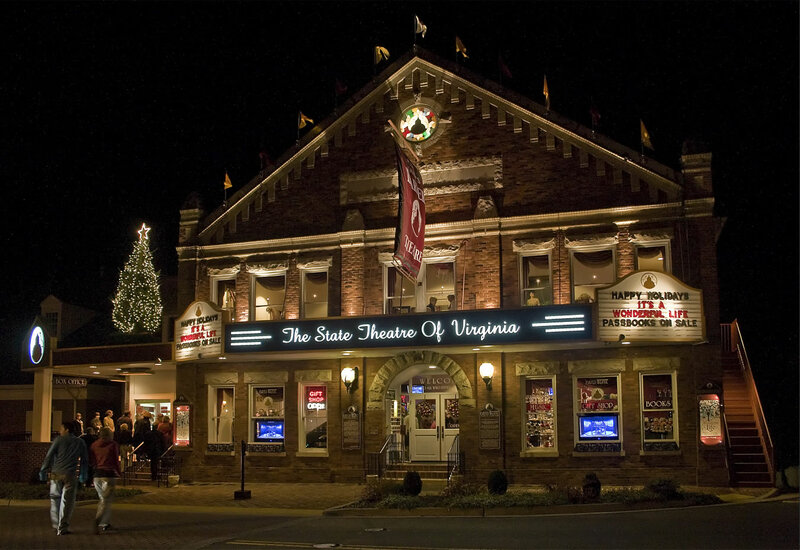 You’ll get awe-inspiring snapshots while also having the unforgettable experiences that come with the magic of the holiday season in Virginia! Plan to take your holiday photos at a Virginia Mountain Resort, then stay for an entire weekend for a getaway absolutely filled with fun. With on-site luxury spas, excellent restaurants within the grounds, and endless activities, including ice skating, skiing, snowboarding, and tubing, you’ll find that two or three days aren’t close to long enough to explore a mountain resort in Virginia. Virginia’s towns and cities all decorate their Main Streets for the holidays to some extent, with some going simple and sticking to lights and a few strands of garlands while others cover practically every square inch with tinsel, wreaths, and ornaments. Many Main Streets have a centerpiece tree, illuminated with thousands of lights and covered in ornaments with themes tied to the local area. The storied rolling landscapes of the Blue Ridge Mountains make for an awe-inspiring backdrop. Pro-tip: Although you’ll have to plan carefully to get the timing right, the pictures will come out best if taken around sunrise or sunset. Hotels anticipate lots of travel around the holidays, so it comes as no surprise that they take their lobby and grounds decorations seriously. Giant illuminated trees, countless wreathes, and unique holiday surprises are a few of the decorative touches you can expect with a visit to Virginia’s hotels. In addition to splendid holiday décor and world-class Virginia wine, you’ll find tons of seasonal events happening at wineries around the Commonwealth. Take your photo inside the tasting room in front of a roaring fireplace, or brave the cold for a few minutes to get a breathtaking background for your Christmas cards. There are now almost 100 LOVEworks located in every corner of Virginia and some of these are decorated for the holidays. If you’re road tripping through the Commonwealth in the upcoming month, take a look at the LOVEwork map and add a short detour to take your holiday photos! Get two items checked off your holiday checklist when you head to a Virginia Christmas tree farm this season. First, pick out the perfect tree for you and your family, and then take a picture in front of it to make a fun holiday memory last forever. Many tree farms even offer free hot chocolate, cider, visits with Santa, or other extra perks for the kids. Something about the twinkle of lights makes a holiday photo absolutely beautiful, and there are plenty of places around Virginia that offer this luminous addition. You’ll discover endless lights at tacky lights tours around the state, streetside setups at local businesses, historic sites, and even botanical gardens. For a family-friendly light display, visit Busch Gardens Christmas Town, which is the biggest holiday light display in all of North America! You can’t go a few miles in Virginia without coming across a notable historic site, and most go all out for the holidays, with classic (and often historically relevant) traditions and decorations. Stop by a historic site, plantation, or presidential home for a blend of history and holiday. If you plan on taking the family to a theater or music performance during the holidays, use the opportunity to take your holiday photos as well; the kids will already be dressed up in their holiday best, and that is not always an easy feat! Plus, the decorations add a festive backdrop that will make a gorgeous Christmas card. Where’s your favorite holiday photo opp spot? Share them with us in the comment section below. Good old historic hotel to stay for hunting season too. !